quite a simple outfit, but also the best kind of outfit, because it involves polka dots! i really can't get enough of them. it doesn't help that they're everywhere in the shops right now... i can see myself wearing them all year. i might even shun florals this summer in favour of my favourite dotty things. no idea why my face is so pink in this photo. the freezing weather and constant wind is making taking my outfit photos a real ordeal lately! i'm looking forward to summer if only because taking them will be so much less stressful! I really love this cardigan, but they don't sell it in the US F21! Not fair! Hehe. This outfit is perfect in it's simplicity! Love the cardigan, the colour is so nice! I tried on that Topshop dress, I really liked it but it didn't look as good on as it does on you! Ah, I was trying to hunt down that dress in the yellowish colour I think they had a while ago, but no luck. You wear it beautifully! i still love that cardigan, the colour and texture are perfect. i really need to stop forgetting to look at the forever 21 website! I am quite a fan of the polka dot too! i've been noticing that my face is pinkish/reddish tinted in photographs recently. the cold, windy weather is not working for me. can it be spring yet? My face goes so pink with this wind too, its so cold! I love the colours in this outfit; the white, peach and blues of the poka dots! Just a lovely combination. i love the polka dot dress! it's so perfectly you! 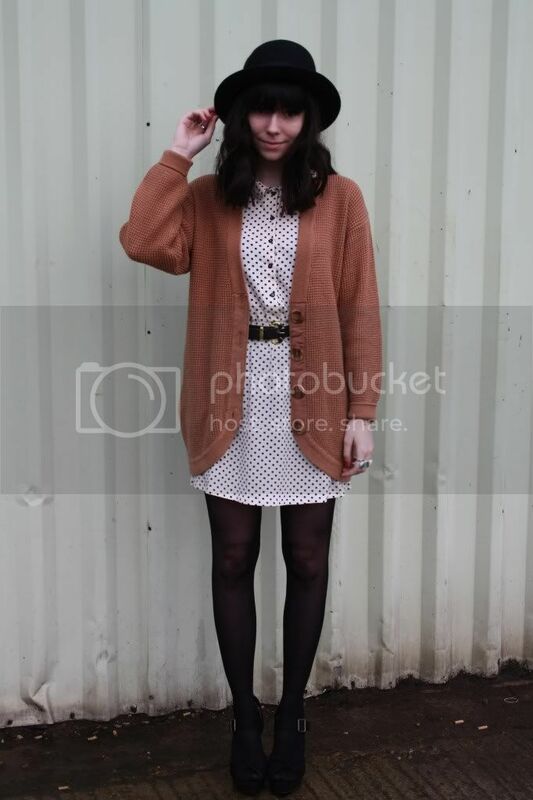 The brown cardigan goes really well with the outfit! forest green & denim jeans.